The dome isn't actually growing, but there's still exciting news about Mount Saint Helens. 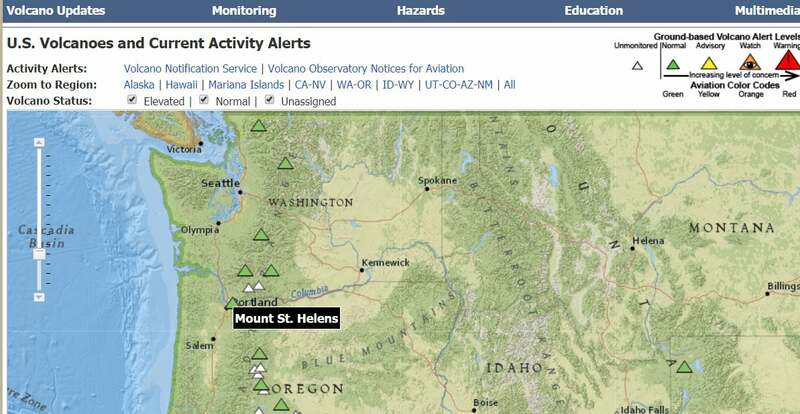 I'm sorry to have to be the one to tell you this, again, but Mount St. Helens is not erupting. It's really not. Yes, I know some British tabloid breathlessly reported that it's totally for sure very definitely erupting right this minute, and of course an NBC affiliate in the western US picked up the story and credulously ran with it without checking. It's all bunk. This is why I'm using archived links rather than rewarding their nonsense with tasty direct links and views. Their reporting is bad, and they should feel bad. Mount St. Helens isn't erupting. It hasn't erupted since 2008. If you see what looks like an eruption, it's probably going to end up being rocks and dust kicked up by rockfalls and wind. It's been quiet for so long that the USGS hasn't even bothered updating its current alerts page since April of 2014. If there was an eruption, it would have been blurted all over the USGS Volcanoes Facebook page the instant the government shutdown ended, but all they're talking about there right now is the return of the Yellowstone Caldera Chronicles (no, Yellowstone is not erupting either, despite the same British tabloid having a conniption about it last week) and some upcoming talks on Kilauea (also not currently erupting). The American volcanoes are all being boring, except for a few in Alaska, which are being mildly interesting. Mount St. Helens is still classified as one of the most dangerous volcanoes in the United States, but right this minute, hazards are limited to normal non-eruptive stuff. So, if someone comes up to you shrieking about the mountain going boom, check with the USGS before you share in the hollering. Normally, I wouldn't even bother picking on a tabloid and one gullible news site, but they've presented me a prime opportunity to discuss happenings at our favorite mountain, and recommend a good show for you. It turns out the British tabloid got its inspiration from a documentary me and my partner watched a couple of weeks ago. Mega Disaster: It's Happened Before and it Will Happen Again is streaming on Amazon Prime right now, and it's actually really good. It talks about several different eruptions, including Kilauea, the Soufrière Hills volcano on Montserrat, and Mount Pinatubo. It talks a little bit about the May 1980 eruption of Mount St. Helens, but focuses more on the dome-building phase in 2004-2008 and the methods scientists used to monitor it. It's definitely worth a watch! Just keep in mind, it's talking about eruptions that have already ended. There's plenty of exciting stuff happening around Mount St. Helens, even though the dome isn't actually currently growing. If you do a search for news, you'll see there's an unsolved murder up by Cougar, close to the volcano. If you happen to have any information on this tragedy, please do contact law enforcement. Deep in the Earth's crust, a plug of cooled igneous, or volcanic, rock keeps magma from surfacing between Mount St. Helens and the rest of the volcanic arc. Meanwhile, the crust under the Mount St. Helens consists of an ancient scar caused by two continental plates slamming together. The scar is "almost like a soda straw, which is allowing these deeper magmas to preferentially ascend to the surface," said Paul Bedrosian, a geophysicist at the U.S. Geological Survey (USGS) in Lakewood, Colorado, and a co-author of a new study on the region, published Monday (Sept. 3) in the journal Nature Geosciences. You can actually read that paper online, and it's intriguing. I plan on doing a writeup in the not too distant future, after I've gotten my hands on the other recent papers exploring related subjects. Yay new knowledge! There's also a really nice slideshow accompanying the above article. It has some lovely views and shows what working in the field is like. Mount St. Helens will provide us with plenty of awesome action in the future. But not just yet. Don't worry: if she does start erupting, I won't waste a second in letting you know!